This statistic shows the estimated damage a successful cyber attack will cost a U.S. business. 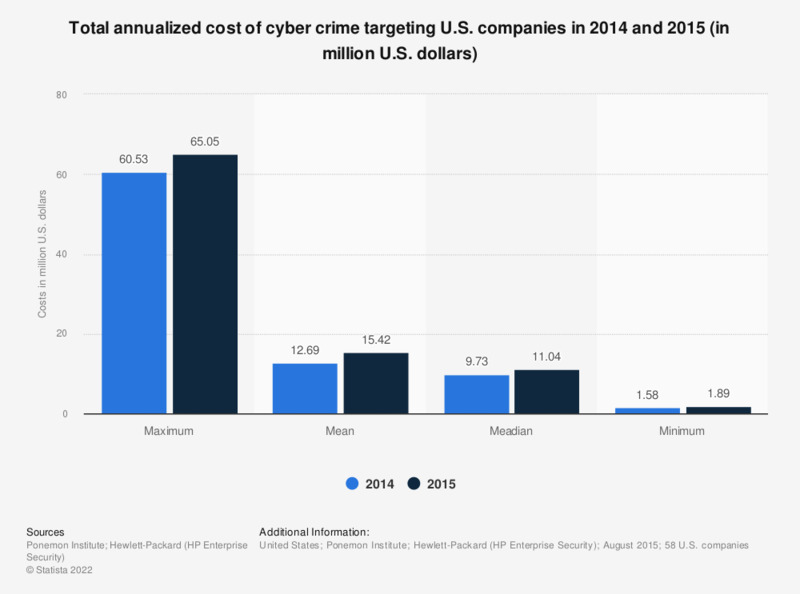 In 2015, the maximum total annualized cost of cyber crime committed against U.S. companies amounted to 65.05 million U.S. dollars. Cyber crimes refer to online attacks targeting groups, individuals or companies through means of computer and networks. Cyber attacks can target computers directly or have primary targets independent of the computer network. Cyber attacks generate significant costs for the victims, ranging from data loss to financial costs through data recovery, preventive measures such as investigation, forensics and reputation management, as well as data investments in new technology. Common cyber attacks targeting computers include various incarnations of cyber terrorism through denial-of-service (DoS) attacks, computer viruses and malware. Attacks using computers as a means to carry out other forms of malicious online activity include phishing, espionage, fraud or identity theft, as well as cyber warfare. The costs of cyber crime are calculated by the direct and indirect expenses incurred by the victims. The four main cost-centers are detection and discovery, escalation, notification and finally, ex-post response. Cyber attacks also damage companies’ reputations and diminish the confidence of current and future customers, resulting in lower turnover and customer acquisition rates.